Got a Makey Makey? Then this tutorial is for you only. Those who are unaware of what Makey Makey is: Its an Invention Kit for Everyone, is an electronic invention tool and toy that allows users to connect everyday objects to computer programs.Using a circuit board, alligator clips, and a USB cable, the toy uses closed loop electrical signals to send the computer either a keyboard stroke or mouse click signal. 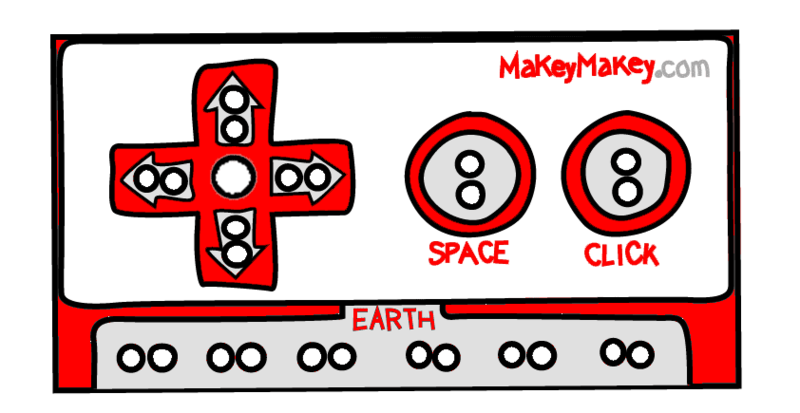 This function allows the Makey Makey to work with any computer program or webpage since all computer programs and webpages take keyboard and mouse click inputs. Your computer may ask you to install drivers or do other setup. You can click cancel or close the window. Connect one end of an alligator clip to “Earth” on the bottom of the front side of Makey Makey. Now you can try making your own drums out of anything. How about a banana cowbell, a watermelon bass drum, or a crash cymbal sound when you high-five your friend? Make anything into a key! You can make a connection through anything that’s even a little bit conductive. 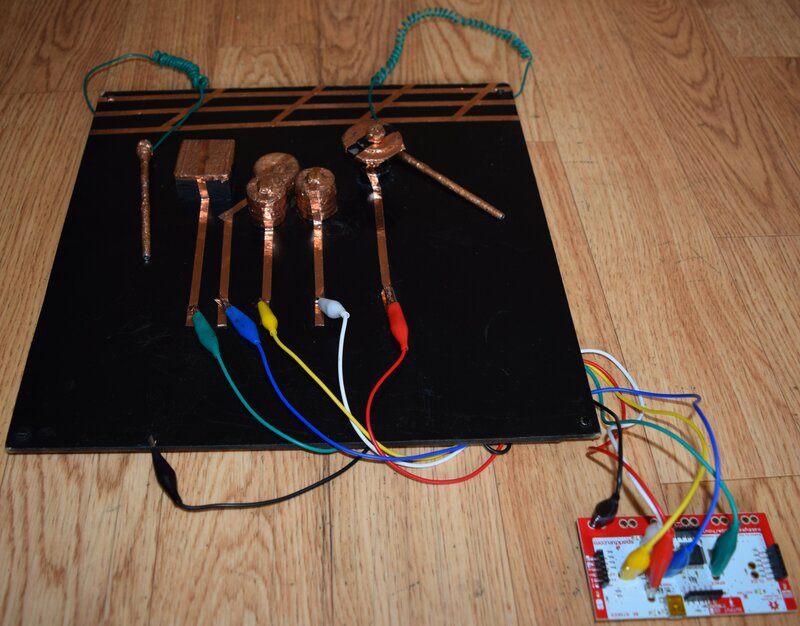 You can also create inventions that combine conductive and non-conductive parts. Lots of other foods work too. We’ve tried marshmallows, gummy candies, macaroni and cheese, cupcakes, shrimp, and lots of other things. It’s also important to have around some tools for cutting, like scissors and exacto knives, and ways to stick things together, like hot glue, superglue, various kinds of tape, and clips or clamps. 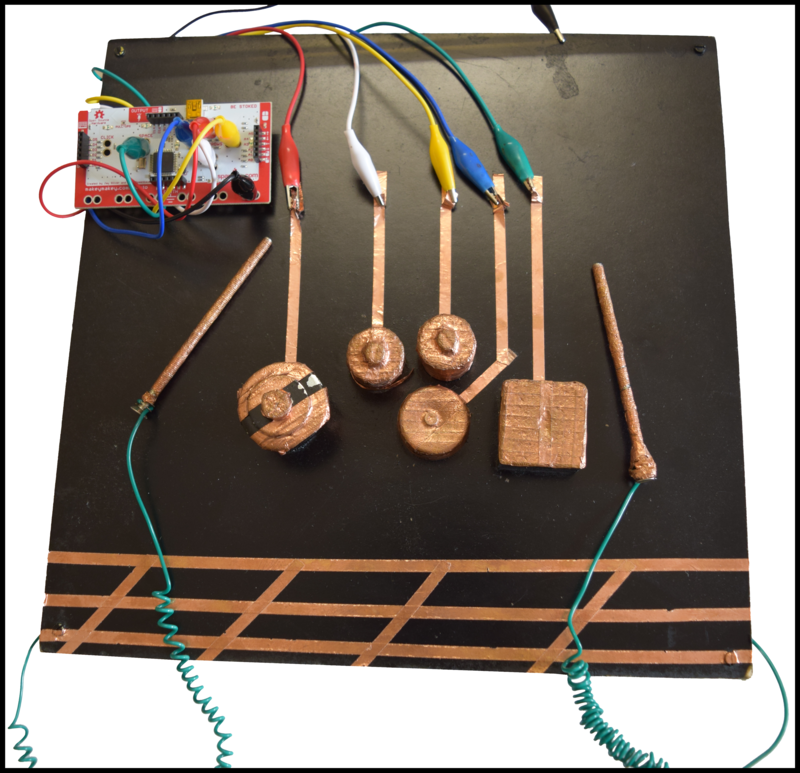 Makey Makey works with any software that uses the keyboard or mouse. You can really use any web page or any computer app. Craft Dummy musical instrument: In this step we carved small Cylinder shapes using wood to be used as drums. We had used the Plastic bottle cap as well and used some nuts, bolts, washers and screws. You are free to use anything available around you. Assembly: Its time to assemble the shapes on one platform, we had used 4mm MDF sheet to make one setup. We put screws to hold the shape in position, you can use double sided tape as well. Once all the shapes are arranged properly on the platform our half job is done. Adding ground plane and Stick: Try to add some ground plane using copper tape near to your instrument setup, so that you can play the instrument using hands only, since you are making drum set, so its better to make some sticks to play the drum. To play the drums, it is necessary that your sticks must stay grounded, we used one metal bolt to use as sticks to play the drum and we added wire to it and tied the wire to the Setup base plank. Testing Continuity: Make sure that all the tapes are well connected, do a continuity test using multimeter. Run Program: We had used Drum set program built using Scratch to play our drum set, visit this link to try it out. Test all the Instruments: Make sure that you are able to hear sound after you run the scratch program and grounding any one of the instrument, either with hands or usign stick you made to play the drums. If all went fine till this point, you are now having a drum set which you can play to make some music and show it to your friends. Hope you enjoyed making it, will join with other tutorials soon.